General Hospital (GH) spoilers tease that an exciting comeback’s in the works. 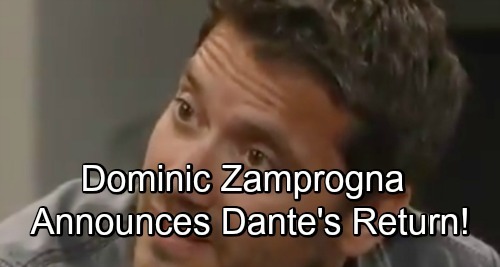 Ever since Dominic Zamprogna left the role of Dante, GH fans have been longing for his return. Port Charles just isn’t the same without Dante around! Thankfully, we’ll get a mini Dante fix pretty soon. Zamprogna recently revealed that he was back on set, so viewers can look forward to a Dante sighting down the road. Unfortunately, it seems this will just be a quick popup. Dante’s not back for good, but we’ll take what we can get! On Twitter, Zamprogna made the announcement and posted a fun pic. He teased, “Dante for a day? Happy to be back with the #gh fam.” Zamprogna was obviously thrilled to make a brief return and visit his old castmates again. Of course, we have to wonder what GH has in store for Dante. Since it’s just a one-day thing, Zamprogna probably only filmed an episode or two. Lulu (Emme Rylan) has been in touch with Dante by phone, but we haven’t see his side of the conversation. Perhaps General Hospital will let us see Dante’s point of view later. In other words, Dante’s appearance will be onscreen, but there’s no guarantee he’ll be in Port Charles. On the other hand, Dante might make time for a brief trip home before jetting off again. He could plan on it being a romantic surprise, but it’d probably just end in disaster. Lulu wants her hubby home permanently. She won’t like it if Dante has to dash off once more, so this could mean trouble. There’s even a chance Dante will wrap up his current mission and announce another one. Maybe his WSB gig suits him. Dante may like the new life he’s living and ask Lulu to wait it out a bit longer. This could lead to an explosive fight and possibly some divorce threats. Whatever the case, General Hospital spoilers say things look bleak for Lulu and Dante’s marriage. Their relationship will head downhill fast, so be prepared for Dante’s drama-filled return! We’ll give you updates as other GH news comes in. Stay tuned to the ABC soap and don’t forget to check CDL often for the latest General Hospital spoilers, updates and news. General Hospital Spoilers: Nina Finally Gets Her Miracle Baby – Daughter Tragedy Brings Pregnancy Twist?